She calls me "Mama Leisha": I'm The Featured Blogger...HOW NICE! Welcome to the weekly Super Stalker Sunday hop! 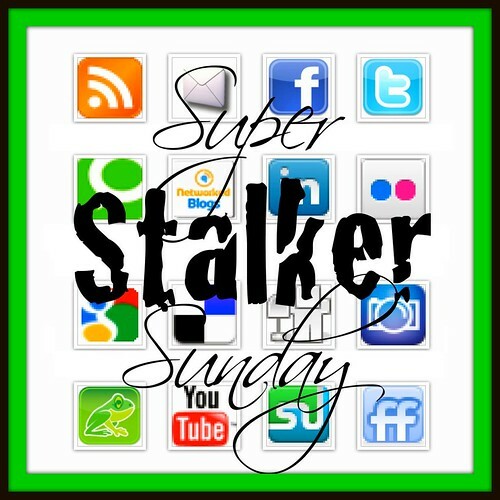 What is Super Stalker Sunday? Blogs hops are a great way to meet other bloggers, socialize and gain more followers. Do you like to socialize? Well, we all like followers, right?! If you've been around the blogosphere you know there are Blog Hop's for everything you can think of and every day of the week: RSS Feed, Google Friend Connect, Email Readers, Facebook Fans, and Twitter Followers. Well, why not get all of your followers in one place once a week? This is the place to do just that! Follow each host at least one way. Don’t forget to let them know you did so by commenting on their blog. We will return all follows, but please be patient as we are busy mama’s it may take us a few days to return the visit and follow. You will only have to link up on one of the host sites and your link will appear on all as we use the same linky. After you follow the hosts and the featured blogger, follow at least the four blogs listed above you on the linky. If your time permits, follow as many other blogs are you are willing! If you’re already follow somebody via GFC, consider following them in another way as well! Remember: You will only get as much as you give. The more blogs you can visit, the more visits you will gain in return. We are all here to socialize and greet, not visit only your blog. While we encourage sharing our button and hop with as many as possible, it is not required. The more you spread the word though, the more we socialize and all gain followers! Aleisha loves participating in blog hops, finding new blogs to follow, and meeting new friends. She feels so fortunate to have met wonderful women and mothers 'out there' in the blogosphere; women who are working hard to do their best everyday. Once she starts following a blog, she loves sending emails and leaving comments. And believes that the establishing of friendships is the greatest! If you would like to be a featured blogger, being shared with more than 4,000 combined followers between the hosts of this hop, please link up! At the end of each week we will select a blog via Random.Org to be the featured blog for the following week. This linky will remain open until 3:00PM EST on Monday! Each week, we’ll choose a featured blogger from all active participants. Go ahead, stalk up a storm! Hi there Ms. Featured Super Stalker guest host!! Hope you are having a great day!! Thanks for linking up with us to Super Stalk and maybe you can join us again next weekend! Kortney @ Kortney's Krazy Life! Congrats on blogger of the week! I was positive I already GFC followed you from a previous hop but it told me to "join"
soooooo stalking you already :) awesome that you are blogger of the week. personally, i would have named you blogger of the YEAR! maybe next week :) LOL! Yay for you for being the featured blogger!! That is awesome!! Just wanted to stop by and say hi from the blog hop and be your newest follower! !